I have a confession to make. 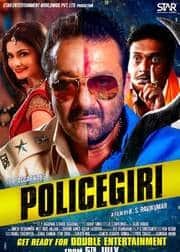 I was planning to watch only half of Policegiri and post my review. After 3 years of doing this job, I figured I could wing it, but the movie got so crazily weird as it progressed; so absurd in its action sequences, so mad in its dialogues and so strident in. It's Save Sanjay Dutt campaign (they devoted a full song to glorifying him) that I was glueI to my seat in amazement. Plus, it's full of South Indian actors and set in some South Indian town and you expect everyone to suddenly start speaking in Tamil. Surreal to the extreme. So, Sanju baba is the combo offer guy- buy one get one free is his speciality. So you get police bhi and gunda bhi. He beats up the baddies but still takes bribes from them. And then also finds time to romance Prachi Desai and dance in a way that makes Sunny Deol look like Michael Jackson. He shoots to kill, throws punches that send men flying in through a windshield and back out of the rear, has burning cars flying over him, and then chucks his Ray Bans into the air ( Salman, what have you started! ), where they stay suspended so that he can use them as a rear view mirror to deflect daggers and shoot the guys who aim them at him. AMAZING. There is superb dialogue(sorry for tapori language, kya hai na, asar hai). The villain is trapped in the middle of a circle of bales of hay. A driverless car is slowly going around in circles dripping petrol. Then Baba sets it on fire saying combo offer "jalaaoonga bhi aur dafnaoonga bhi." Kay hai na, he is a combo of a Muslim mother and Hindu father.oh God! Meri to death hi ho gayi I tell you. But the villain is not dead. He is waiting for the sequel to happen when Baba comes out of jail to give you combo offer, headache bhi aur sardard bhi.